Recently, testimony from three public hearings in Massachusetts suggested that excessive disciplinary action for non-violent offenses, such as tardiness and truancy, exacerbates the dropout crisis. Testimony indicated that students already behind in school are often forced to miss additional days through suspensions, which leads to a loss of credits and an inability to catch up. Some parents, educators, education stakeholders, and coalitions, including the Massachusetts Graduation and Dropout Prevention and Recovery Commission, have called for a closer look at school discipline policies and practice. Many observers have come to believe that fully understanding the role of discipline is an essential step in tackling the problem of why some Massachusetts students are not staying in school. It is within this context that the Rennie Center for Education Research & Policy embarked upon its examination of school discipline in Massachusetts. Act Out, Get Out? Considering the Impact of School Discipline Practices in Massachusetts reviews why discipline policies are necessary, laws governing these policies, and national research on the effects of disciplinary removal. The brief then describes overall trends in the disciplinary removal (suspensions and expulsions) of Massachusetts public school students over time (school year 2005-2006 through 2008-2009) and findings from a more in-depth analysis of discipline data from the 2007-2008 school year. Key findings from data about the 2007-2008 school year include: 1. For the most serious infractions, those involving illegal substances, violence and criminal activities the most common reason for disciplinary removal is violence; 2. Out-of-school suspension is the most frequently used form of disciplinary removal; 3. The number of disciplinary removals peaks at 9th grade and declines in 10th through 12th grade; 4. Particular segments (low-income, special education, male, black, Hispanic) of the student population are removed at disproportionately high rates. 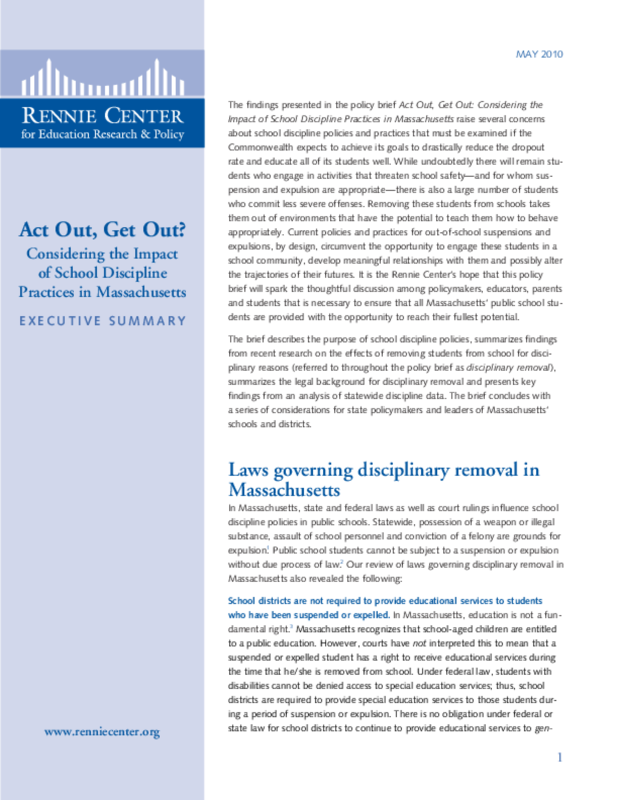 This policy brief highlights essential questions that need to be answered in order to fully understand how discipline policies are being carried out and to tease out the relationship between disciplinary removal, the achievement gap, and dropping out of public schools in Massachusetts. The final section of the brief puts forth considerations for policymakers and K-12 school and district leaders. The brief suggests there is a need for more detailed and complete record keeping of school discipline data as well as for more schools and districts to implement school-wide preventative approaches and alternative education programs for students who have been removed. The brief also questions the extent to which of out-of-school suspensions are used for non-violent, non-criminal offenses, particularly those for Pre-Kindergarten and Elementary School aged students. The brief was the subject of discussion at a public event on May 26, 2010. Copyright 2010 Rennie Center for Education Research & Policy. All rights reserved.